Again, I am no great historian on the Civil War, but rather I want to tell you about a great house site, and a story. Up along Route 15 just north of the City of Frederick stands the house built on the Richfield property after the home of Thomas Johnson there burned in 1813 as a result of a servant girl’s embers catching fire beneath the stairway. We only have the vaguest descriptions of a three story, grand house, built of English bricks, and the house design there now replicates the one built after, as the current one was also rebuilt after a tornado in 1929. It was similar to Prospect Hall. The home was surrounded by a thousand apple trees, to make spirits and supply fruit. George Washington stayed there twice in 1785, and again in 1791. From there he could see the ‘blue hills of Maryland’. In addition to spirits, the plantation contained a barrel operation, wagon house, blacksmith, sawmill, grist mill, tan yard, and the Tusacarora glasshouse. It was said that a wagon pulled by four horses could turn around in its central hallway. After Johnson, it was sold to the Goldsborough family in 1795. This story hardly leaves out a connection to any of the historically well-known Frederick families, for it starts back with John Thomas Schley, who built the first proper house on Patrick Street and had a daughter, the first white child born in Frederick County. This Schley family marries into the Shriver family, and into the Goldsborough family. 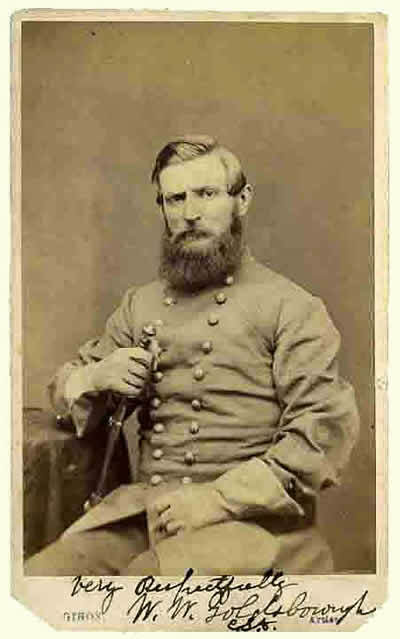 Second Son - Charles a Union man, surgeon with the Fifth Maryland. They came across each other first in Winchester, when William captured Charles and sent him to Libby Prison in Richmond, Va.
A few weeks later at Gettysburg, at Culp’s Hill, William Goldsborough takes command after his Commander is wounded and leads a charge “…nothing less than slaughter…”. Two thirds of his men are killed. William has a bullet through his left side and spends nine months in union hospitals in Gettysburg and Baltimore. His brother Charles, released, finds him in Baltimore. Family history claims the two brothers never spoke again after the war. Their son, Edward Ralston Goldsborough, gains fame in the Frederick area as an amateur anthropologist and geneaologist, and advocational archeologist. Artifacts collected by him remain at the Hessian Barracks in Frederick, awaiting professional conservation in the near future. Ralston was a civil engineer by trade, he has been said to have walked the Frederick streets offering to do family geneaologies for a dollar. He studies, collects and identifies the Rosenstock and Biggs Ford archeological sites, as well as Native American sites on Richfield. He contacts Smithsonian anthropologists and publishes materials on native culture in the Frederick area. His work is followed up in more recent times by Slattery and Woodward. Richfield as Thomas Johnson knew it burned down in 1813. 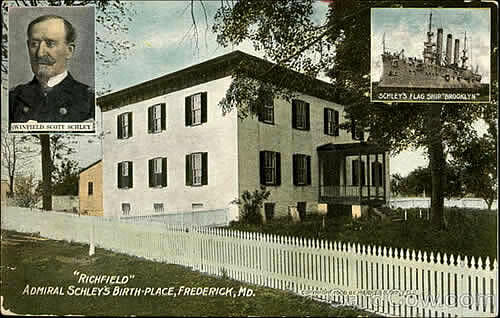 Admiral Schley was born at Richfield in 1839. He is named after General Winfield Scott who was visiting the family. As a Naval Officer, he rescues the Greely Artic Expedition. He comes to be called the Hero of Santiago for actions off Cuba during the Spanish-American War. 1824 - The Marquis de Lafayette visits Richfield. 1863 - Kilpatrick's cavalry division camps at Richfield. George Custer receives his commission here. 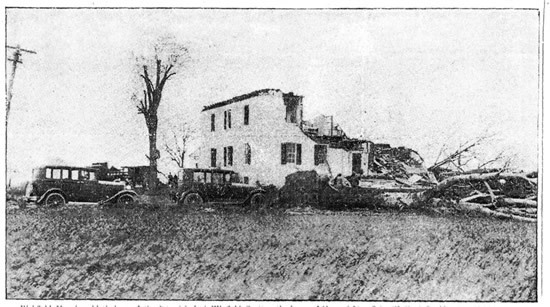 Richfield suffers a destructive tornado in 1929. The farm buildings are completely destroyed. But it was rebuilt again. Richfield was purchased by Bruce and Francis Crum in 1946. Today it remains owned by the Crum family. They also own and protect the Biggs Ford Native American archeological site. Richfield is a 138 acre stock and crop farm at the very border of Frederick City. It is a rich archeological site, from Ralston Goldsborough’s exploration on the farm, to the SHA’s findings along Rt 15, a blacksmith, carriage wright, barrel maker, and glass works. Quite possibly Richfield is the richest colonial archeological site in Frederick. The Crum’s report large earth impressions of missing structures during droughts. Today it is on the target list for annexation by the City of Frederick. When William Goldsborough dies, he tells his wife, "Don't bury me among the damn Yankees here!" He lies with fellow Confederates in Baltimore. Many of his Union kin lie in Mt. Olivet Cemetery in Frederick.